Asking the Hard Questions to Ensure a Stronger & Healthier Tomorrow. Natalie Pace, co-creator of the Earth Gratitude project and bestselling author of The Gratitude Game, The ABCs of Money and Put Your Money Where Your Heart Is. U.S. 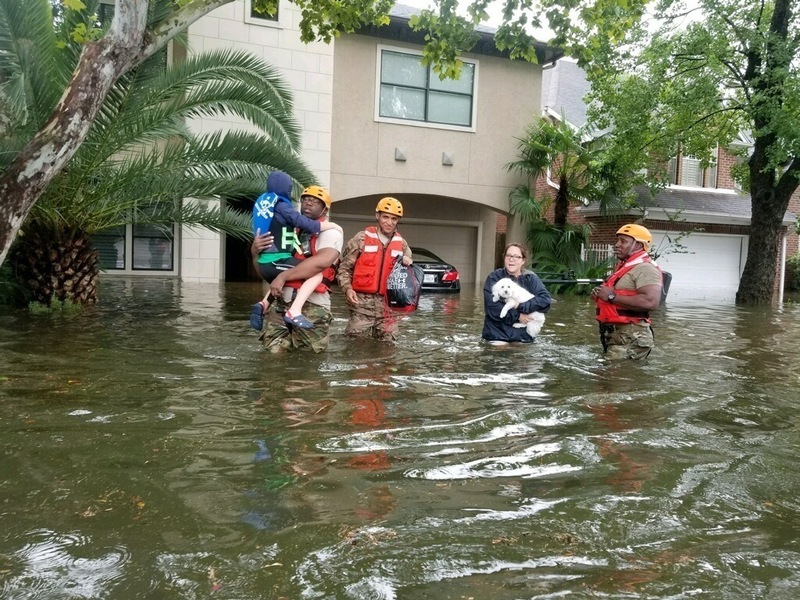 Soldiers assigned to the Texas Army National Guard arrive in Houston to aid citizens in areas heavily flooded by the storms of Hurricane Harvey Aug. 27, 2017. (U.S. Army National Guard photo by 1st Lt. Zachary West) www.dvidshub.net. Public Domain photo. The hurricanes and flooding in Houston and Florida have galvanized our nation to come together and help those in need. Words cannot describe America’s heartbreak at the devastation and loss of life. Many of us acted quickly upon our heartfelt desire to be of service and to help, donating to the Red Cross, Habitat for Humanity, the Hand in Hand benefit and other organizations that are on the ground helping with the recovery and rescue. The Hand in Hand Hurricane Relief Benefit (a Comic Relief event) raised over $44 million. Congress came together with a $15.25 billion disaster relief package, allocating $7.4 billion to HUD and FEMA and $450 million to the Small Business Administration. If you’ve been affected by the flooding, here is a link to the National Flood Insurance Program, where you can file your claim. As the rebuilding begins, Houston and Florida will need to ask hard questions before making a plan that makes the regions stronger and smarter. Flooding and hurricanes are predicted to increase in severity in the coming years, posing significant challenges for all coastal communities lying along the Eastern Seaboard and in the Gulf of Mexico. 1. How will rising sea levels and intensifying storms affect my area in the years to come? Any plan should have a horizon that can span longer than a few decades. (Most home loans are 30-years!) The map below, which has been assembled by the Union of Concerned Scientists, shows the cities along the Gulf of Mexico and the Eastern Seaboard that are most at risk from sea level rise. If your home lies along these coasts, it’s time to educate yourself on the risks of rebuilding where you are. 2. Should I rebuild here, or higher up on the hill, or is it time to consider downsizing or relocating? Being in an area that is at high risk of repeated flooding, hurricanes or even inundation due to rising sea levels will likely be a recurring nightmare for you personally, and could mean that you will not be able to sell your home in the years to come. There are areas in the Gulf of Mexico and along the East Coast of the United States that already have to disclose the risk of rising sea levels in the home sale process. 3. How can I rebuild (here or elsewhere) so that my new building or home is more energy efficient, environmentally friendly, clean and healthful? A well-insulated home, school or office building with passive solar engineering can reduce your utility bill by 50%-90%. A garden box can provide enough fruit and vegetables to feed a family of four for months. Fruit trees offer clean air and food, and pull carbon out of the atmosphere. Grey water plumbing recycles shower and dishwater into garden irrigation, conserving fresh water and lowering your water bill. Today’s architecture and interior design must include Passive House technology, organic gardening, xeriscape and other clean technology tools in order to truly serve the client. * Protecting your health and that of the planet. Whether you are in charge of your own personal project, or in charge of a municipal effort, now is the time to drink in relevant data and envision a better tomorrow for your family, friends, neighbors and community. The Earth Day Network. The Earth Day Network offers expertise and guidance on how to green your school. Green schools can slash their lighting bills in half (or more), save $10,000-$16,000 annually on utilities and more. The Edible School Yard. The Edible School Yard, founded and sustainaed by visionary chef Alice Waters, connects schools around the United States (and beyond) in edible curriculum, best practices and healthier school meals for students. The Passive House Institute US. Passive homes and buildings cut heating costs by up to 80%-90% and cooling costs by almost half. The designs are location specific. Imagine what you can do if you were saving thousands each year on your utility bill! Habitat for Humanity, LivingHomes, BarlisWedlick architects and more offer innovative solutions and ideas to have a clean, healthy, green home and building. H.R.H. The Prince of Wales seeded the ground for his organic farm and garden in 1985 — well before this was a popular trend. He has written many books, including Harmony and The Elements of Organic Farming. Green Our Planet helps schools crowd-fund their garden classrooms. Ron Finley is transforming food deserts into oases. student-run farmer’s market ever held in the United States. Photo (c) Green Our Planet. Used with permission. The Department of Energy offers tips on conserving water with your landscaping. Click to access a blog from the Environmental Protection Agency on conserving and reusing water. Under the vision, guidance, funding and aegis of H.R.H. The Prince of Wales, Leon Krier did the master planning for a community where bikes and pedestrians would be preferred over cars. Poundbury, England, an urban extension of Dorchester, is a quaint community that accommodates the commuter, while celebrating a post-petroleum, cleaner lifestyle. Over the years, many major cities have adopted bike-share programs. The global bike share leader is Motivate, which partners with governments and brands to launch successful programs. The Earth Gratitude Project brings together visionaries and respected world leaders to share their wisdom on all things sustainable and green. You will be inspired and perhaps even surprised at how easy, rewarding, fun and cost effective it is to adopt the principles outlined in the picturesque mini ebooks. Download your ebooks free at http://EarthGratitude.org/. The National Flood Insurance program would be out of business, if taxpayers weren’t supporting it. So, as business owners, we owe it to America and to those living in places at risk of flooding, storms and inundation to rebuild with a smarter plan. Bailing a leaky boat is not the best idea. The Netherlands has been below sea level for centuries. Are the solutions for the coastal regions of the United States found in the Dutch models of deltas and dams? Here’s a link to a Harvard University blog on what other nations are doing to protect their coastal cities. Now is the time to reassess and envision everything, with the hard facts, data and questions at the heart of the plan. Sometimes things fall apart so that better things can fall together. Building a better and stronger tomorrow requires a serious and forensic analysis of what is truly needed to protect people, property and the planet today, and in the decades to come. I have been specializing in sustainability and financial literacy since 1999. Over that period of time, I've been blessed to co-create the Earth Gratitude project and write 3 personal finance bestsellers. The Earth Gratitude project features sustainable living, clean energy projects, gratitude and protection of our common home, with wisdom written by the world's most respected leaders, including His Holiness, The 14th Dalai Lama of Tibet, Elon Musk, H.R.H. The Prince of Wales, Kathleen Rogers (the president of The Earth Day Network), Arianna Huffington, Wangari Maathai, Global Green, the NRDC, Ron Finley, and many more. Download your free Earth Gratitude mini ebooks and join us for 14 days of sustainability and gratitude at http://earthgratitude.org/. Each year on Earth Day, April 22nd, we encourage everyone to power up the gratitude and power down the grid with an epic hour of personal net zero celebration. The ABCs of Money was in the top 15 of Investing Basics on Amazon for 3 years, with over 120,000 downloads. I've been ranked the #1 stock picker, above over 835 A-list pundits, by an independent ranking agency. My easy-as-a-pie chart nest egg strategies and Thrive Budget have saved homes and nest eggs since 1999, during a time of two colossal recessions, when most people lost more than half of their net worth, and over 7 million people lost their homes.